Look what’s happening in East Tennessee. 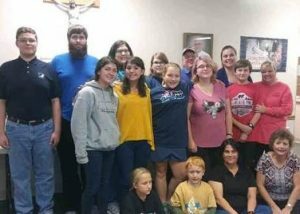 In the diocese of Knoxville, parishes are joining Challenge and Conquest from Chattanooga to Knoxville. My name is Margaret Merrill and I have the great privilege of helping parishes in our diocese to implement and build their teams for Challenge and Conquest. We are beginning to realize that Challenge and Conquest help to create a vibrant parish by building relationships on many age levels and then, best of all, a relationship with Jesus. Just this past month I had the privilege to join St. Therese in Clinton, TN to help them roll out the program . This parish did it right. The pastor along with a deacon and the Director of Religious education invited the whole parish to come and see. With everyone on board working together it made for a great night. Parents and children were led in prayer before enjoying a meal together. I followed up with a presentation that explained the what and how of the program. Parents got to ask questions and look through the books and see all the fun shirts and accessories. The parish priest also mentioned how impressed he was with how the program works, saying it’s a new way to reach our youth. The deacon commented that Challenge and Conquest team leaders from a parish down the road are on the diocesan leadership team. He thanks Challenge and Conquest for their formation in making them true leaders who keep giving back. They have woken up to their potential to build the local church. Following the meeting,where they initially had only two High School Team Leaders, word spread in a few short weeks and they now have ten Team Leaders and several adults. Perhaps people think their parish is too small. But here you can see how to reach out and start the building process. Get the word out by hosting a night where the whole parish is involved and get to know Challenge and Conquest, a program for youth that can help us all on on our journey to Heaven. UPDATED – Conquest For Life!